Hey all! I recently finished the 4th piece I’ve added to my current 12 part series. Each piece represents a month of the calendar, and this one is June so it would actually be installment 6 but I’ve skipped around a bit. To catch up new comers, I am working on a series of 12 mixed media, surreal, conceptual portraits in which the meaning is influenced by the use of pattern and color. They will depict women of all ages, races, and time periods, and each will communicate a different theme. I aim for the pieces to speak to women’s collective experiences beyond their differences. I give you, June: She Is Constantly Evolving. I think this is quite literally the happiest piece I’ve ever completed – There’s even a puppy … that is unreal. I mean, a couple years ago I actually was told by the manager of a local restaurant that I had to remove a couple of pieces from a show I’d hung there because they were afraid it might send patrons spiraling into depression. You’re not a real artist if your art has never been ousted from anywhere, or so I’m told. Not that everything I make is gloom and doom, but to have butterflies, puppies, flowers, smiling with teeth, and cotton candy clouds all together in one piece is not usually my jam. All of my work centers around people’s inner worlds, and sometimes confronts difficult or uncomfortable emotions. Even my pieces that convey overt happiness usually have some sort of edge or oddity to them. I remember meeting my blindly assigned roommate in college for the first time. Once she found out I was an artist, she wanted me to do some large paintings for the common room, but “They have to be cute! Not scary!” Apparently she thought I was some sort of dark , twisted soul, which is quite funny as I had Sanrio posters all over my bedroom and Bart Simpson print pj’s for god’s sake. (I was to find out later that until we became friends she was afraid to put out any of her Hello Kitty themed toiletries in our shared bathroom, and also only watched America’s Next Top Model in secret when I wasn’t home for fear of my scorn.) To fulfill the cute requirement, I made a painting of a girl holding her kitten surrounded by retro, colorful power flowers. But … I gave the kitten purple dragon wings. This is so Museum Of Bad Art worthy in the most hilarious way, that I’m actually saddened I tossed it. It’s one of those compositions that is so bad it goes right past bad and back to good again. All this to say, this is a rare piece to be one that conveys nothing but pure, unadulterated joy and exhilaration. It’s ironic that I created this at a time when joy and exhilaration were about the two farthest things from my mind. As seems to be the general consensus, 2016 has been more than a little trying, and it sure decided to go out with a bang in November and December. This piece is about transformation, as symbolized by the presence of butterflies, and maybe it was the idea that change is certainly most appealing during the most wearing of times, mixed with a bit of my love of holidays that makes it impossible for me to stay cranky around Christmastime. Either way, this piece speaks not to who we are right now but who we wish to be, and reminds us that nothing is permanent, and that sometimes that isn’t a bad thing. See this design and more in my Redbubble Shop. 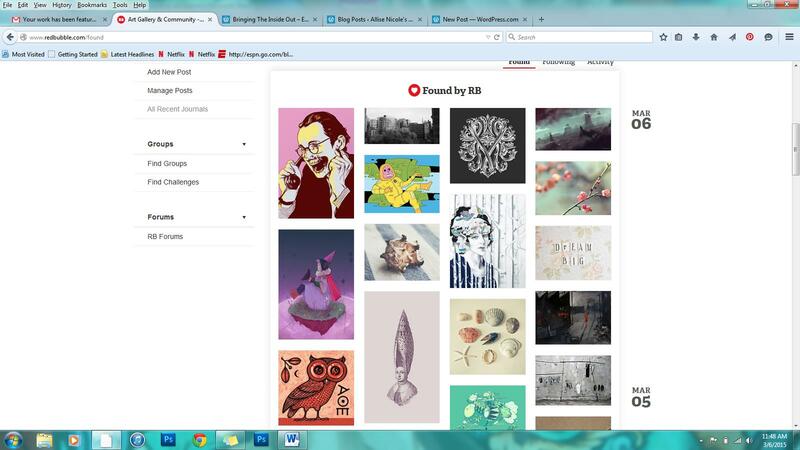 Work Featured Today In “Found On Redbubble” Front Page! I got a big surprise this morning, one of my conceptual portraits “I’d Have Been Happier As A Bird” was featured on the found by redbubble front page! It’s the grey-scale portrait second row, 3 over! Redbubble in general is amazing, and I can’t believe I have waited this long to set one up. Not everyone is interested in hanging something on their wall, and this site splashes your designs over all kinds of objects you can use in day to day life like T-shirts and tank tops, mugs, phone or tablet cases, stylish tote bags, decorative pillows … Given my interior design background, having my designs printed onto custom pillows makes me way too excited. The prices are very reasonable as well, not much different than what you’d pay for the same items in a “regular” store, and those with boring stock designs decorating them rather than unique artist-made work! Please check out my shop; I am working on some new designs specifically for RedBubble, and will also be adding some more of my more popular fine art work as well. I may just have to feed my coffee addiction and get a travel mug in the “I’d Have Been Happier As A Bird” design for myself :). I’ve always been attached to that piece, and it makes me so happy that others are appreciating it as well. Thank you, world!